KUALA LUMPUR: Siemens Malaysia is currently seeking local and international players to partner for the upcoming tender, as it has expressed interest to bid for the Kuala Lumpur-Singapore high-speed rail (KL-SG-HSR) project. “The interest in the KL-SG-HSR stems from the good proposition and compelling package it believes it can offer, as well as its extensive experience it brings to the table with complex integrated solutions around the world and in Malaysia,” the firm said in a statement yesterday. Siemens also said it has the necessary project management expertise to manage highly complex and supply projects as it has had a strong presence in Malaysia since 1982. According to Siemens Malaysia, it has delivered 58 sets of automated trains for the full phase of the Mass Rapid Transit Line 1 (MRT1). Additionally, it has also received a Letter of Acceptance for the Light Rail Transit Line 3 (LRT3) signalling and intrusion prevention system and platform screen for this 36km line that spans from Bandar Utama to Johan Setia. In December last year, both Malaysia and Singapore inked a landmark deal to build a 350km HSR between Singapore and Kuala Lumpur, slated to start operations by Dec 31, 2026. As many as 10 Japanese companies are eyeing a slice of the estimated RM60 billion KL-SG-HSR project, intensifying the rivalry between Asia’s two largest economies. The HSR will have eight stations — the terminal in Bandar Malaysia and Jurong East in Singapore, and six intermediate stations in Putrajaya, Seremban, Ayer Keroh, Muar, Batu Pahat and Iskandar Puteri. Chinese firms have made clear their intention to secure the 350km rail line, which will cut rail travelling time and spur economic development along the corridor. Tokyo’s interest in the HSR project ballooned after the cancellation of TRX City Sdn Bhd’s proposed 60% stake sale to IWH CREC Sdn Bhd to develop Bandar Malaysia — which will house the KL-SG-HSR link. In May, commercial attaché for the Japanese Embassy in KL Sosuke Tanaka said the award of the HSR contract to Japan will serve as an impetus for an influx of new Japanese investments into Malaysia. Japanese companies were also engaged in the construction of the MRT project. 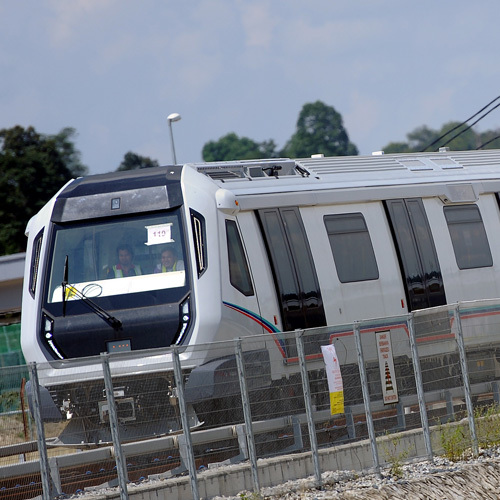 Mitsubishi Heavy Industries Ltd was tasked with the construction of the 51km Sungai Buloh-Kajang line. Also, six Singapore companies, brought together by International Enterprise Singapore, announced their intention to partner each other with plans to team up with international players to jointly participate in HSR projects, starting with the KL-SG-HSR.